Quilty Habit: Quilting Gallery Giveaway! I went to Mt Fuji! OOO - nice giveaway!!! My birthday was on SMS giveaway day in May last year so I spent the day at work then in the evening I did some blog-sopping and entered some giveaways!!! A perfect birthday!! Went out to dinner with my family! My birthday was over Labor Day. I went to the huge annual flea market in Hillsville VA. Scored some vintage hand pieced blocks. Happy Birthday! My birthday is in February so that's almost a year ago...what did I do? what did I do? Ummmmm, we were probably at our ranch at that time of year so I'm pretty sure I was hunting feral hogs. . Thanks for the opportunity to win your giveaway. I love using charms in my sewing. I spent the day with my husband allowing him to spoil me. He took me to the fabric store and cooked me dinner, perfect! I went out to dinner with friends on my birthday! Mine is in October, I went to dinner with my in-laws on Saturday and with my siblings and brothers-in-law on Sunday. My birthday was in September and I enjoyed a day of my hubby cooking all the meals and taking care of everything. Happy Birthday! My son's is the 19th. Mine is in May and I don't recall exactly what I did but I know there was no cooking or cleaning that day! Mine was in February and I don't remember what I did😞only few more weeks till the next comes! I hung out with my kids. :) Thanks for the great giveaway! Happy birthday! Just spent time with my family this year. I hope you have a wonderful birthday! oh my...for my birthday I pretty much spend it just relaxing at home! *smile* thanks for the wonderful giveaway! How about I tell you that last week for our 35th anniversary we went out to dinner at a "modern Italian" restaurant and were too full for dessert! My husband took me to Portugal!! I took my daughter to her soccer game for my birthday! Hubby and I don't really celebrate our birthdays. Spent the day w my newborn, who was 3 weeks old at the time, and then we all went out for Italian food with the whole family! We rented a boat and cruised around the intracoastal :)I love seeing my cathedral window swap gift from you in your header up top!! My birthday is right after Thanksgiving so I spent it in Florida with my mom. In July, I enjoyed my birthday in a little cabin on the shore of Lake Superior. WONDERFUL - walked the beach all day & big bonfire at night! Looking forward to your winter quilt tute in January. I went out to dinner with my family on my birthday. Thanks for a great giveaway! Didn't do anything great on this birthday but hubby got us tickets to go to New York to see Mamma Mia on my 40th. Best birthday ever! I spent my birthday at the ballpark watching my son play baseball :-) Thanks for the chance to win - I love Sweetwater! I spent my birthday at the como zoo and went on the merry-go-round with my sweet little one who was 1 1/2. She loved it almost as much as I did. The night before my birthday we went to the outdoor theater in our town and then my husband surprised me by taking me out for ice cream and even brought birthday candles! I spent a great day with my mom who was home from Arizona! I spent the day pretending it wasn't my birthday. I'm 18 and my son is a figment of my imagination I tell you. Happy Birthday!! I went to a very nice dinner with my boyfriend this year. Thanks for such a generous giveaway! On my birthday I gave my daughter a birthday party at her homeschool co-op. Not a good birthday this past year. (Funeral). This coming February for my birthday I will be on a quilting Carribean cruise! I am so looking forward to spending it at sea with my husband and other quilters! We went to Mount Vernon - as we were in VA on a ministry trip. Hubby took me there afterwards for my birthday. =) Thanks for a chance to win. Gosh, I can't remember what I did on my last birthday. That is so sad. I can't remember but this years birthday is going to be my 40th, so I better remember it! For my birthday this year in July, I had an opportunity to go to the Outer Banks for the first time. I was absolutely beautiful and so relaxing!! I turned 40 in Nov. I had dinner with my parents. It was fun! Thanks for the chance to win! We dropped the kids off at Grandma's and went to Texas Roadhouse for dinner! It was amazing! Happy birthday! Your bday is the day before mine!!! On my birthday this year I went out and bought myself some cake. No one else remembered to get me cake, so I got it myself! Thanks for the chance to win! Have a wonderful birthday! My birthday is in February and I honestly can't remember what I did to celebrate last year. But I know I was working and my photo album tells me I took some pictures of lovely sun dogs. It was my 30th so I went out with a bunch of friends for a drink and dessert. On my birthday this year I was on a plane flying back from Taiwan - it was a very very very long flight! my husband took all of us out to dinner - it was the first time we went out with our newest baby, and it was a wonderful time! My last birthday was a half biggie and it was way back in April. But I want to wish you a very happy birthday and happy Ie Cream Cake eating. I LOVE ICE CREAM CAKE!! I also hail from NJ a long time ago. I went to dinner at my favourite restaurant with my family. Thanks for the lovely giveaway. On my birthday this year ,November 3,I invited the family to dinner and we had a yummy food and cake.Thanks for the giveaway! I had to work on my birthday this year, but I came home to a wonderful meal cooked by my husband.......and he did the dishes! I didn't do much. It was a weeknight. We went out to dinner, had some dessert, and went home- pretty usual evening. Thanks for the chance to win. Nothing special, just went out to dinner with my kids. Happy birthday! I celebrated by going out dancing. Thanks for the great giveaway! Merry Christmas! It was my 30th birthday, and my sister planned an awesome dinner and party for me and some friends and family. Lots of fun! :) Thanks! This year was sort of boring. We just went out to eat since we bought our first house (yay!) a few months prior. I spent the day with a quilting buddy checking out new to us quilt shops. It was wonderful! Thanks for the chance at your giveaway. Fireworks display--birthday is 4th of July. I go to a different place every year! This year, I stayed home in my pj's while my husband baked me a cake (unheard of!). We spent the day just relaxing and watching movies. I hung out with my kids and some friends, and enjoyed a birthday cake made by my husband! Thanks for the lovely giveaway! Fun giveaway! My husband took me for a weekend getaway for my birthday! Truthfully, I don't really remember. I know I had to work that day and I think we may have gone out to eat. I guess it wasn't very memorable LOL Thanks for the chance to win! ate dinner alone (husband was working) and was glad I was not living in a place where I had to jump up and run to the door for trick-or-treaters while my dinner turned cold. Got the house decorated by surprise from my family!! i spent my birthday with family and a day off of work! My husband took me to Gold Class movies to see the new Sherlock Holmes movie. Here in Australia, Gold Class movies is a theater with big soft reclining chairs and they serve you pizza or whatever you order. It's very nice and fun for a birthday! I splurge myself with some fabric shopping.. a "little" gift for myself..
What a gorgeous give away you have, love those colors! On my birthday I just had to teach my class. As a teacher I can't take a day off, so I celebrated my birthday with playing games with the childre (7 - 8 years old)and we had fun. In the following weekend friends and family came at my place to celebrate. Have fun with your give away and thanks to organize the fun for us! I went back to work after being off for surgery! I hope you have a happy birthday! Mine is at the beginning of January (which is also when my baby is due!) so I can't remember what I did this year but hopefully in the new year I will spend it snuggling with a healthy, happy baby! I got my Japanese craft magazine in the mail during the morning so I read that while my children had their afternoon rest, threw together tea for my family and then went to a Kindergarten committee meeting in the evening!! Had a great birthday this year. My daughter had a baby, a darling little girl and I was helping SIL and the 3 siblings keep the home shipshape. Best birthday present ever. Thanks. We were on vacation - driving through Zion on my birthday this year. We went to WV to visit relatives for my birthday. Went to dinner withmy husband. I went to the Chocolate Cafe with my partner and my best friend and had lots of their lovely chocolate. Yummy! Thank you for the lovely giveaway. These hops are such a fun way to 'meet' new bloggers. 2. Mine was last january so I don't even remember it! 3. LOVE LOVE LOVE those text fabrics...hoping to get some to make may grand daughter (12) who loves to write, a quilt and to cover some composition books for her for HER birthday in April!!! Looking forward to seeing your winter quilt! I'm a new follower and really anxious to follow your apartment enhancements! I can't remember what I did on my birthday this year! Became another year older, for sure! It was in May, and I really don't remember! Probably slept as I was pregnant. I had a birthday bbq with family and friends. We went out to my favorite Indian restaurant and had a lovely meal with my husband and kiddos. I went to Las Vegas for the weekend with two girlfriends... And it wasn't even a big birthday! Well, this year I turned 30 the same day I lost my job, so I made a huge party to forget I was old and unemployed. You need some sense of humor when things get hard! For my bday in October, I flew to New Mexico and spend a week in the high desert, land of Georgia O' Keeffe, with my best friend. We worked, ate, laughed, freaked out, hiked, painted, and I took photos. It was great fun! Wish I could do it every year! birthday with the family. Allways nice! Thanks for the give away. This year my birthday was the day before Thanksgiving. We drove from San Antonio, Tx to Star City, Arkanas. Due to Holiday traffic it took about 13.5 hours instead of 12. We had a van with 6 adults and 2 babies. It was a little rough trip. We left around 4 in the afternoon when everyone was off work and arrived 5:30 am at my mom's. After a little nap we were all good. It was worth the effort. My birthday is in February. I go see Mom because she always gives me $100.00 for my birthday. I usually take half and buy me something at Kohl's. Then buy Kentucky Fried Chicken for dinner that I share with my husband. Then, in another year, you do the same thing all over again, except you are 1 year older. I love your idea for the giveway. You're sharing and that is so nice of you. I am a follower of yours and am looking forward to the tutorial for the winter quilt next year. So, I will be back. Thank you for the chance to win and Happy Holidays. Hmn what did I do on my birthday this year? - That really is a good question... I can't remember!!!! Awesome giveaway. My birthday was on a Wed last month, and on the Sat of that week I had an open house to celebrate with friends and family. It was just something that I wanted to do, instead of cooking supper for about 30 (family members) who otherwise would have counted on that. Well my birthday isn't until next weekend so I haven't celebrated yet. But I am hoping to spend some time with my wonderful hubby, maybe go out to a nice dinner. A movie would be great too! On my birthday, I ate cake! On my birthday, I spent the day doing whatever my heart wished and then we went for a family dinner at my sister's - it was a perfect day!!! My girlfriends all took me to dinner and then we did glow in the dark bowling! We had my family in town the week before for my baby's baptism so we went to dinner early with family in town! I quilted and I ate French Silk Pie.. YUMMMMY! My mom visited and took me out to my favorite Polish bar/restaurant for dinner! Great fabric choices! Jess, I hung out with some quilty friends the evening of my birthday but the night before we went to see a concert called Blackie and the Rodeo Kings. Have a wonderful birthday. Your birthday is the same day as my brother's and the day after our son's. Our son will turn 25 this year. Would you believe I can't really remember? How bad is that? I know I had cake at work, we all get a birthday cake on our birthday (isn't that great?). But what the heck did I do???? Sorry, it was probably like a regular day. My daughter and I went out to brunch to celebrate both our birthdays (on a day in between); I have no idea what I did on the actual day. Spent the day with my little girl and had a delicious dinner. My husband was in school all day so it was a pretty normal day, but good. Well, my birthday is in this month. I got together with my family for a wonderful chili dinner. Yum! I'm a late December birthday so I'll be knitting or sewing if it's raining. If it's fine I'll knit or spin outside in the sunshine, with lots of sunblock on. First, I am a major sweetwater fan and would love to win - I've actually a quilt in progress using this line and could use a bit more fabric. It was a lovely day in the fall and I celebrated my birthday with a picnic with my DD. Happy birthday. This year I spent my birthday taking a lovely warm bath at our termal center in Furnas, then had a lovely lunch and a walk around. I didn't do anything for my birthday this year... but next year we are going over to the UK to celebrate my birthday with family and friends because it's a big one!! Happy birthday! This year I had to work and since I got married just a couple weeks later I was busy at home getting things ready after a quick dinner. Thanks for the chance at the giveaway and have fun celebrating! Jess, I wish I could remember what I did on my birthday! Happy holidays! I turned 50 this year and it was very low key at my cabin in the mountains. Perfect! Hope you have a great birthday. 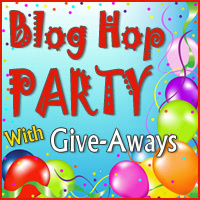 Thanks for participating in the Blog Hop Giveaway. ohh you shouldn't have reminded me of that - I sat through a three hour written exam on my brithday ... I did like that a bit better than the oral exam on my las years birthday - ahh and I unpacked my mothers parcel and ate a huge helping of ice cream and did nothing in the afternoon, no studying for the next exam for me that day. Nothing special went on here for my last b-day. Don't remember, it was in January! Your birhtday is the same as my niece and my father-in-laws....Happy \Birthday!! On my birthday this past July; my husband took me out to supper. For my birthday this year, the kids came to the house for dinner. A nice quiet evening. My husband purchased a Gidget II sewing table for me which I just love!!! My children gave me fabric! I went to our quilt guild meeting and my friend treated me for lunch in a Mexican restaurant afterwards. My husband and I went to visit a few wineries on the NY Finger Lakes! thanks for the chance! My birthday this year was spent getting up at 5am, getting to work by 7am and working until 3pm with no one wishing me a happy birthday all day. I took off from work and quilted! My Birthday is in October and I had to work both jobs! After work I came home and spent some time with my son and had a yummy chocolate cupcake!! Thank you for a chance to enter your giveaway! My hubby sent me on a "quilter's dream getaway" to Lancaster, Pennsylvania for my birthday. It doesn't get any better than that! My daughter was born on the same day as me, so we always celebrate together. this year, we had a family barbecue. Thanks for the opportunity on a wonderful draw and have a very merry Christmas. I love Sweetwater and don't have any of this line so I am so excited at the change! This year my birthday was boring - last year for my 50th I went on a mission trip to Cabo San Lucas, MX. It was wonderful! My mom and sister came out to PA to visit me from MI and we went out for a lovely dinner! Great giveaway! My birthday this year was a working day for me, but I had a nice lunch and went out for dinner. I love your blog. I enjoy looking at finished projects. Your bubble train quilt is lovely. On my birthday in May we had a family gathering with lots of good food and cake. My daughter and grandson were here for it, so it was a great one. I worked on my birthday! Thanks for being in this fun blog hop. Merry Christmas. my birthday is in Feb. and I'm embrassed to say I don't remember, but my guess would be we probably went out to eat and I got to pick the place. I don't remember my birthday) but i hope we eated cake))) thank you for the giveaway! Eleven months ago is a long time to recall my 77th birthday. I'm sure my kids showed up with a cake and lots of funny cards. My birthday was a Monday in June, so we celebrated on the weekend with a special meal and cake. Thanks for the giveaway. I got to help some quilt guild set up for our show this year on my birthday. It was a lot of fun. Happy early birthday and thanks for the giveaway! I had a wonderful grillparty in our garden. My birthday is in August. My birthday definitelyt was nothing special. A normal day of takeing care of kids house hubby & dog. But I did score dinner out. And my hubby got a me a new E reader tablet which is wonderful. My birthday is July 31 and I didn't do a lot, I was sick for it, ugh. Hope you enjoy yours! I had a surprise party, and it was great fun! .......thanks for the chance to win! A few close dear friends had a get together and we ate cake and laughed alot!! Happy Birthday to you! May your year be filled with many happy days! My last birthday was special because I had my second daughter 2 weeks before, so this is the only "celebration" I could have at the time- but it was a great gift... :) Many thanks for the great givaway! Happy birthday! :) For my birthday, my husband and two of our friends took me out for dinner and then to a bookstore. It was lovely! My birthday was January... I actually can't remember what I did! I know my husband was off work, so we probably went out for lunch, but it was so long ago! I was at my son's in Myrtle Beach..the best present I could hope for. Thanks. Happy Birthday! My hubby made a special dinner for me on my birthday! I took the entire day to myself and only did what I wanted to do. It was perfect! Happy Birthday!!! My 60th birthday was in July, and my family planned my first surprise birthday party! I was REALLY surprised, and they were thrilled. It was so much fun! Thanks for the giveaway. Happy Birthday to You! Have a GREAT one too! :) My birthday is in March...Our one son & his wife took my husband & I out to dinner! Nice! Rest of Kiddo's called, or came by during the day too. Actually I worked on my birthday this year! I went out to dinner with my husband! I went to lunch with my daughter. My birthday was Wednesday and we went out to dinner. I had worked all day so dinner was as much get up and go as I had. We may do something special later on. My birthday was last April. I don't have a clue what I did. Maybe I should plan something for next year.